Who is Gina Haspel, Trump’s pick to lead the CIA? Gina Haspel is poised to make history as the first female director of the Central Intelligence Agency, if she can overcome opposition from senators concerned about her role in controversial torture methods used by U.S. intelligence agencies during the George W. Bush administration. President Donald Trump nominated Haspel to be the CIA director in March after he tapped then-CIA chief Mike Pompeo to succeed Rex Tillerson as secretary of state. If confirmed, Haspel would be the first career employee-turned director since Bill Colby stepped down in 1976. “She has a particularly strong understanding, certainly more than any outsider would,” said Paul Pillar, a 28-year veteran of the CIA and fellow at Georgetown University’s Center for Security Studies. The majority of Haspel’s 33-year career at the agency has been spent in the Directorate of Operations, helping oversee clandestine spying efforts around the world. Due to the nature of her work, the public has only an opaque picture of how exactly Haspel operates, or what her work entailed. The CIA declassified some material about Haspel’s work ahead of her confirmation hearing Wednesday before the Senate Intelligence Committee. 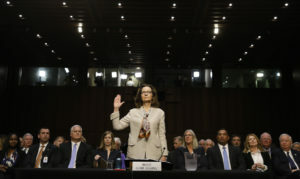 Members of the panel focused on the declassified cables at the confirmation hearing, as well as Haspel’s role in Bush-era enhanced interrogation methods, including during her stint working in Thailand. In Thailand, Haspel oversaw a secret prison, known as a “blacksite,” where prisoners were subjected to interrogation methods such as waterboarding, sleep deprivation and “walling,” where prisoners were repeatedly thrown into walls. Due to the nature of her work, the public has only an opaque picture of how exactly Haspel operates. Haspel was also involved in the destruction of nearly 100 videotapes that showed the torture of two prisoners, Abu Zubaydah and Abd al-Rahim al-Nashiri, as reported by the Washington Post and Buzzfeed News, which obtained internal CIA documents. Haspel said at her confirmation hearing Wednesday that the tapes recorded the interrogation of a single detainee. In 2015, Sen. Dianne Feinstein, D-Calif., the top Democrat on the Senate Intelligence Committee, and Sen. John McCain, R-Ariz., co-sponsored legislation that made it illegal for the U.S. government to torture prisoners during interrogation. The law expanded the scope of the 2005 Detainee Treatment Act, which only applied to the military. On the campaign trail during the 2016 presidential election, Trump supported bringing back torture. At a 2016 rally in South Carolina, he declared that “torture works” and said he would bring back waterboarding if elected. Since taking office, Trump’s Defense Secretary James Mattis has reportedly urged him not to embrace torture as an interrogation technique. Ahead of her confirmation hearing,Pillarsaid Haspel would argue that those methods were legal at the time. Haspel made that point at the hearing, saying that Bush administration attorneys made clear “there was no legal requirement to preserve” the tapes. She was cleared of any wrongdoing by the CIA in 2005. When asked if she would reinstate enhanced interrogation techniques as CIA director, Haspel said she would “under no circumstances” do so. The issue came up later on in a pointed exchange with Sen. Kamala Harris, D-Calif. “Do you believe in hindsight that those techniques were immoral?” Harris asked, saying she wanted a “yes or no” response. The battle lines over her nomination appeared to harden as the hearing wore on. Michael Gerhardt, a constitutional law professor at University of North Carolina, noted that congressional lawmakers are typically “very vocal” when it comes to confirming top U.S. intelligence officials. “It’s not an area people tend to be indifferent to,” he said. The hearing was twice interrupted by protests. 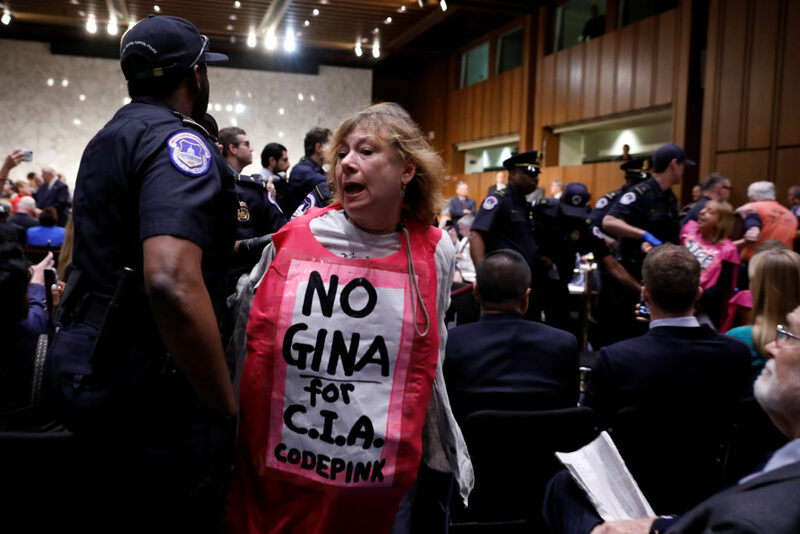 At one point, a protester started yelling, “Bloody Gina! Bloody Gina! You are a torturer!” before being escorted out by Capitol Police. Sen. Rand Paul, R-Ky., has also announced his opposition to her nomination, although he opposed Pompeo as secretary of state before eventually voting in his favor. With McCain out battling brain cancer, Republicans can only afford to lose one vote. Haspel would lead the nation’s preeminent spy agency at a time when intelligence is increasingly being weaponized in partisan disputes. Haspel’s role in the torture programs and destruction of evidence is “disqualifying,” said Ken Gude a senior fellow for national security at the left-leaning Center for American Progress. Haspel also faced questions Wednesday about U.S.-China relations, Russian election interference and other issues she’d tackle as CIA director. Haspel spent two of her 33 years at the CIA as deputy chief of the Russian operations group of the Central Eurasia Division, and held various Russian-related posts in her first 15 years at the agency. Trump has repeatedly questioned the U.S. intelligence community’s conclusion that Russia interfered in the 2016 election. If confirmed, Haspel will likely deal with similar meddling in the 2018 midterms. Haspel would lead the nation’s preeminent spy agency at a time when intelligence is increasingly being weaponized in partisan disputes on Capitol Hill. The White House has pushed for her confirmation calling her in a press release last week “the right person to lead the CIA” due to her “historic and distinguished career at the highest levels” of the agency.